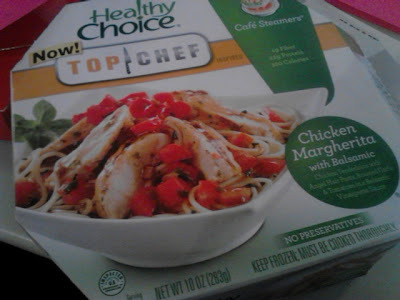 Frozen Lunch Review: Healthy Choice Top Chef Chicken Margherita | The Food Hussy! It's product review time again! Yes - a couple of days a week I'll be sharing product reviews (unsolicited by brands and unpaid) of something many folks out there are probably eating right now - frozen lunch entrees! I got a bit of criticism for these I'm soldiering ahead. While I agree that making food at home and packing leftovers is a better tasting/healthy option - it just doesn't fit into my life schedule so well right now. Hopefully life and work will calm down a bit - but in the mean time - I'm still rocking my frozen lunches 2-3 days/week! 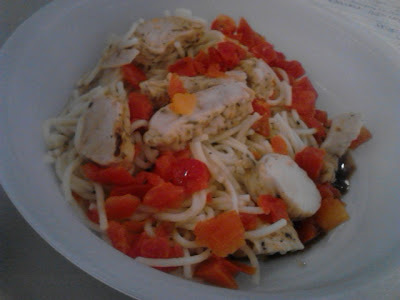 Today's choice was Healthy Choice and one of their Top Chef entrees - Chicken Margherita with Balsamic. I'm a sucker for anything Top Chef so I gave this one a whirl and I have to say - it is VERY different! Some folks have emailed me about the sodium level in these - this one has 600 mg of sodium which is 25% of your daily allowance. Not really sure if that's good or bad - but I'm going to take note of this going forward. This is also one of their Cafe Steamer line - the food is heated in two separate compartments with the sauce on the bottom and the rest on top. Once you're done heating you just empty the top container into the sauce on the bottom. Flavor - No salt needed on this one! The balsamic sauce really has a ton of flavor (and smells good in the office). 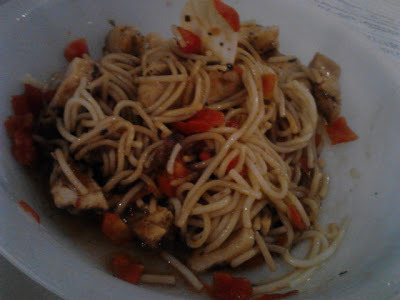 Meat - Chicken is pretty good for texture - a little processed in texture but again - fairly realistic. Very comparable to the pre-cooked salad chicken strips you might purchase. Fullness Factor - today I have a meeting so no side item, other than the giant Red Bull my husband bought me for my jam-packed meeting day today. Hopefully the combo tides me over until 3pm at least! Today's was probably my favorite of the frozen meals that I've had lately. It doesn't overcook and the flavor is very light and fresh tasting - which is pretty unique knowing it's frozen! Yeah to Healthy Choice! I also decided to find a new "thumbs up" image - the creepier the better I say. I have no idea why this was taken - but it made me laugh! I agree! This Healthy Choice variety is awesome! If you haven't tried it already: try the Top Chef Grilled Chicken with Pesto. That's even better in my opinion. Its ironic I had the one you reviewed today and the one that comment recommended yesterday. Very good stuff and it does taste fresh amazingly. I like the two compartments. Its easier to stir everything. The food does taste fresh I agree. It doesn't taste too buttery or like when I don't feel laggy. I'm still hungry after eating it though.